in situ investigations of the catalytic activity of LMCats in general and unraveling the growth mechanisms of two-dimensional materials (2DMs) on LMCat surfaces in specific. As a first step in reaching these goals, an optimized design for an LMCat reactor has been established. The challenge of the LMCat project is the in situ study of graphene growth on molten copper (Cu). We have selected Raman spectroscopy and X-ray diffraction to carry out the intended in situ studies. To have Cu present in the liquid phase, the temperature of Cu in the LMCat reactor has to be at least 1370 K (~1100 °C). At this elevated temperature, Cu will have an evaporation rate in vacuum of ~500 monolayers per second [ML/s] (3.8×108 pm/hour). To be able to investigate the growth of graphene on molten copper with Raman spectroscopy, the distance of the Raman objective lens to the molten sample should be at most 1.5 cm. 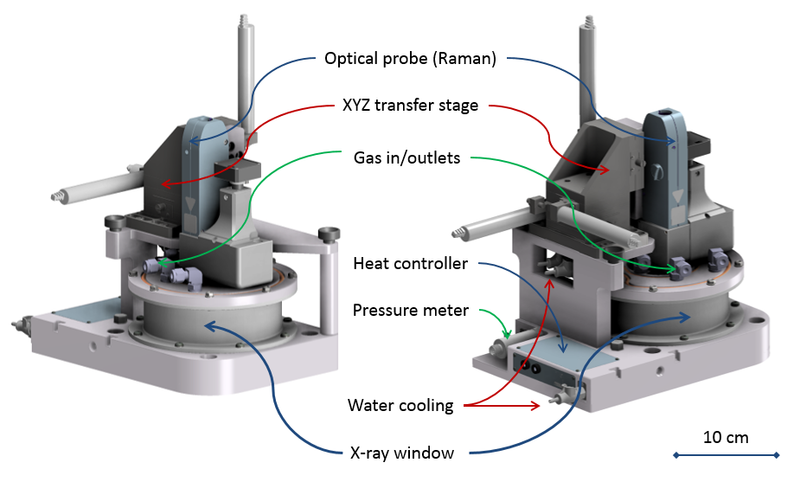 For successful X-ray diffraction measurements the distance between sample and the X-ray-transparent beryllium walls should be at most 10 cm. At such a close distance, the intense evaporation and high temperature of molten Cu will damage the beryllium wall and the Raman window, disrupting the in situ experiments. To protect the beryllium wall and the Raman window, we have implemented special precautionary measures and reactor design. A solution was found in the use of an argon background of 1 bar to carry the graphene growth precursor (methane, CH4), which suppresses the copper evaporation from the LMCat and sweeps copper vapor away from the Be wall and Raman window. Going from vacuum to 1 bar (abs) Ar decreases the copper evaporation rate of molten copper from 500 ML/s to 0.01 ML/s. Using simulations we were able to optimize the flow pattern of the Ar gas, such that it reduces the copper deposition rate on the beryllium wall and the Raman window below 1 pm/hr (1.3 ×10-6 ML/s), and keeps their temperature below 400 K. This ensures the protection of beryllium wall and Raman window during in situ experiments. Now that the design phase of the LMCat reactor has finished, the process of fabrication and assembly of the reactor starts.